McLaren was recognized for the third year running in the 3–4 litre category of the prestigious International Engine of the Year Awards – a hat trick of success for the M838T 3.8-litre twin-turbo V8 engine designed and developed in collaboration with Ricardo. “On behalf of Ricardo I would like to express my warmest congratulations to McLaren on the third year running that its 3.8-litre V8 engine has been awarded the title Engine of the Year in the three to four litre category,” commented Ricardo director of McLaren programmes Jason March. The M838T engine is fitted to the 650S Coupe and Spider, which are the core models in the McLaren Super Series. In addition to the collaboration on design and development, the McLaren M838T is assembled at a state-of-the-art engine production facility at Ricardo’s Shoreham Technical Centre. The facility provides a near clean-room production environment in which each and every process is carried out according to strict, best-in-class quality principles and within a comprehensive ‘no faults forward’ culture. 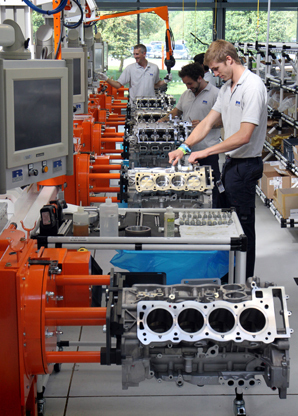 Due to the success of the collaboration on the V8 engine – and the multi-year engine supply contract signed in late 2013 and relating to the years from 2016 onwards, this facility is currently being expanded to allow assembly of up to 5000 engines per year.